The amateur aeronautical engineers from YouTube’s Flight Test are known for their massive flying experiments that are often surprisingly successful. But it’s this tiny creation, an RC version of the flying house from Pixar’s Up that’s held aloft by actual helium balloons, that we’d most like to see available as a kit. 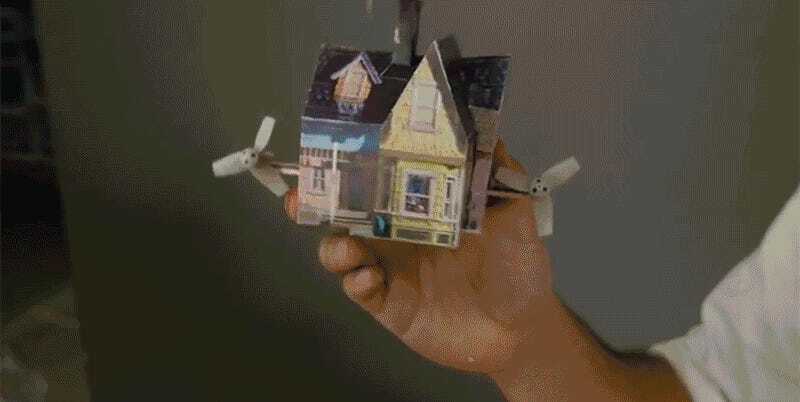 The video does break down how the flying replica was made, including where to download a tiny papercraft version of the house itself. But the engines were salvaged from a flying X-Wing toy, which means you’ll need at least some modicum of skill to transplant them into the tiny abode. In other words, we’ll just wait for the pre-made kit.